Have you seen the latest SC Magazine reviews? 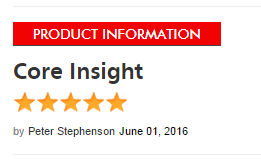 Then you have missed their glowing 5 Star Review for Core Vulnerability Insight! We are so proud of this product and the value it brings to any vulnerability management solution. Core Vulnerability Insight (formerly Core Insight) unifies, regulates, and prioritizes vulnerability management initiatives enterprise-wide. Consolidating multiple vulnerability scans across vendors, while matching known exploits and simulating attacks, enables you to focus on the most vulnerable points of your network. With greater scalability and advanced attack path analytics, Core Insight helps you to accurately identify the vulnerabilities that pose the greatest threat to critical business assets, regardless of the size and complexity of your IT landscape. Once critical vulnerabilities are prioritized, you can move quickly to remediate the threat in your systems. Read what SC Magazine has to say about Core Vulnerability Insight here and if you want to know more about what Core Vulnerability Insight can do for your organization, request a demo today.